Shaun Kelly won’t stop smiling. Photographer Kit DeFever asks him to put on a serious face for our cover shot but Kelly, a COO of KPMG, just can’t hold it and soon the corners of his mouth are curling up again and his eyes are sparkling behind his glasses – ever the Catholic school boy failing to repress some devilish, clever thought. Even in the most lighthearted moment, you can see the intellect at work. Anyone who knows Kelly can tell you how the kid from West Belfast grew up to be Chief Operating Officer of the Americas for one of the Big 4 accounting firms. A mistake that should never have happened. But Shaun holds no rancor. In fact, his experiences growing up during the Troubles have turned him into a champion of diversity with a vision for the future of Northern Ireland as a place where everyone feels comfortable regardless of background. 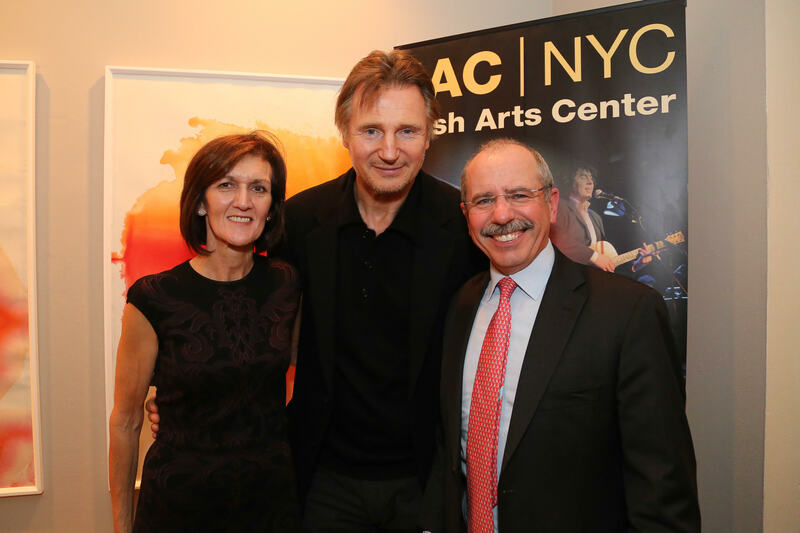 Pictured at the annual Irish Arts Center Spirit of Ireland Gala, Mary Kelly, Liam Neeson and Shaun Kelly. The 70s was also a time of joblessness. “Eighty to ninety percent of Catholic males in certain parts of Northern Ireland were unemployed,” said Shaun, whose father worked for a big construction company. On the weekends, he would do “homers,” installing windows and doors. As the only son (Shaun had two sisters, one of whom has passed away), Shaun would accompany his father on these part time jobs. He went south to University College Dublin (UCD), rather than Belfast’s Queen’s University, because he wanted to play Gaelic football. 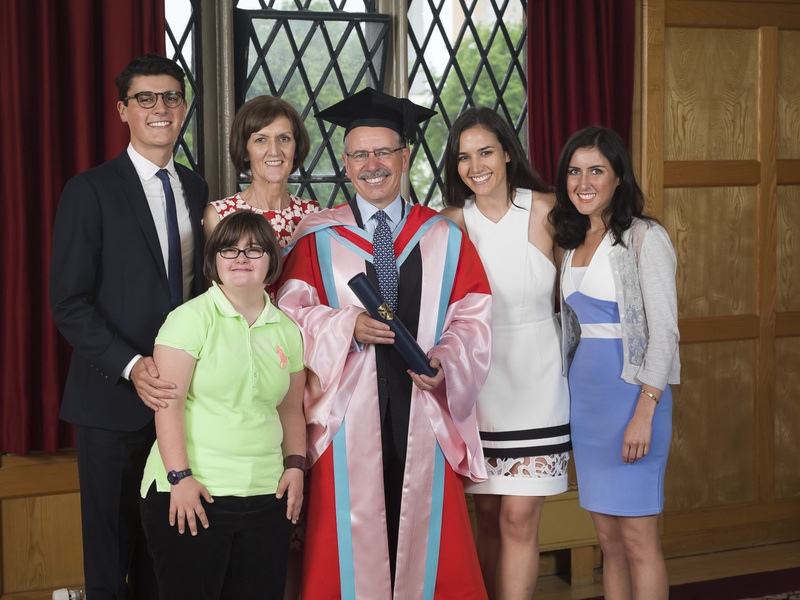 Queen’s University honored Shaun with an honorary Doctorate of Science (Economics) for services to business and commerce. Shaun joined KPMG International’s Irish member firm in Dublin soon after graduating with a first class honors degree in commerce, and in 1983, he sat for the accountancy exam, coming first in Ireland. Within a year, he had gotten married and transferred to the KPMG San Francisco office. He has spent most of his career at KPMG. Taking a break in the early 1990s, he returned to Belfast and was part of the team that established a new audit, tax and consulting firm in the city. But by the end of the decade he was back with the firm. Now, as COO of the Americas, he spends about 60 percent of his time traveling to meet with company leaders in Latin and South America. A student of history, the travel allows Kelly to explore other cultures, and with 162,000 partners and professionals in 152 countries, the firm is a perfect fit for someone with a global approach to life and appreciation for how others live their lives. He’s quick to point out that the firm is more than just about finance. “We are not just a bunch of accountants,” he says of KPMG’s involvement in major world events. 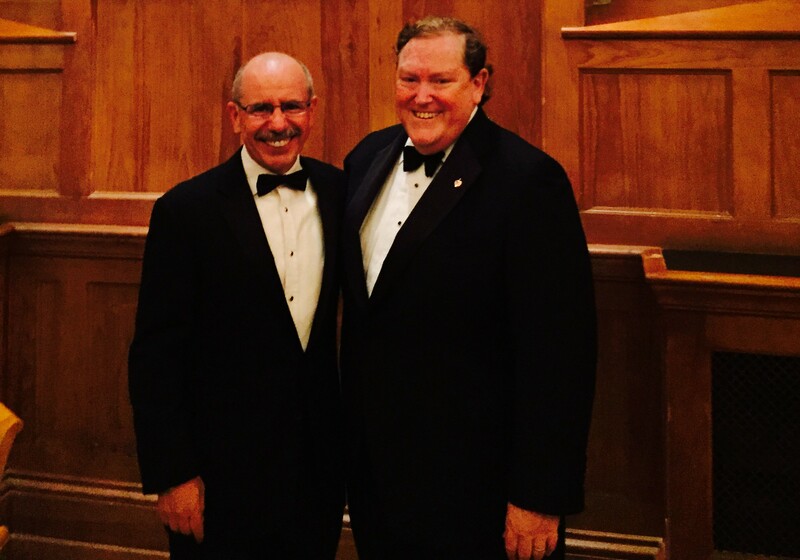 Shaun with Tom Moran, chairman of Mutual of America and Chancellor of Queen’s University, under the portrait of peacemaker George Mitchell. For all the financial transactions that KPMG enacts, Shaun emphasizes that it is also a big-hearted firm with tremendous public outreach across a range of programs. Through KPMG’s Family for Literacy (KFFL) program, which works to eradicate childhood illiteracy, over 2.5 million books have been given to children fromlow income communities since its inception in 2008. He himself is co-chair of KPMG’s Disabilities Network, and a member of KPMG’s Diversity Advisory Board. He is also the treasurer of Enactus, a community of student, academic and business leaders that has the backing of KPMG in transforming lives and shaping a more sustainable world. In all that he does, Belfast is never far from Shaun’s thoughts. He expresses gratitude for Bill and Hillary Clinton’s part in the peace process and their ongoing commitment to Northern Ireland. And he greatly admires former SDLP leader John Hume for his part in the undertaking. His own deep knowledge and commitment to his hometown is one of the reasons Declan Kelly, who served as Hillary Clinton’s economic envoy to Northern Ireland from 2009-11, sought his help. 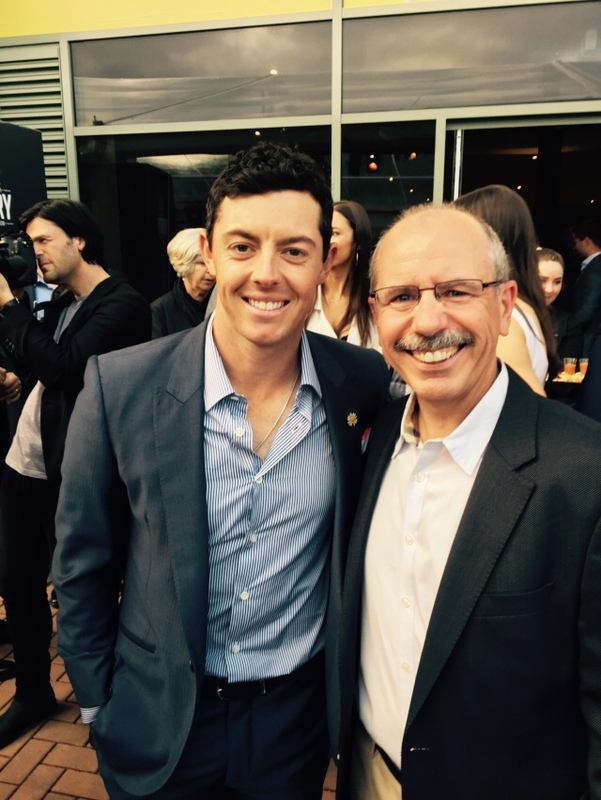 Shaun with NI golfer Rory McIlroy, current number one player in the official World Golf Ranking. “For many reasons, Shaun was one of the first guys I went to when I was putting the advisory group together,” said Kelly. For all his charm and talent for closing a deal, there is one notable holdout who turned Kelly down three times before finally agreeing to his offer. His wife Mary only accepted his proposal on the fourth try – when he had qualified as a Chartered Accountant and “I could afford her.” It’s clear that she’s the love of his life. And he’s obviously the love of hers. How else could you explain the willingness to uproot and move seven times around the globe as Kelly followed his career path with KPMG? He beams too when he talks about his children. His two eldest, Rachel and Natalie, now in their 20s, were born in San Francisco. Rachel is pursuing her Ph.D. in micro and molecular biology, and Natalie works in private equity. His two youngest, Lauren and Timothy, were born in Belfast. Timothy, who is now at George Washington University, is interested in politics. He interned for the British Embassy this past summer, and is involved with the American Ireland Fund Young Leaders in Washington, D.C.
Lauren, now 24, has Down syndrome. “It gives you another perspective, and it made us closer as a family,” says Kelly, who talks about his daughter’s fierce determination. When she was young she was an avid swimmer and has always loved music. She’s one of the reasons why he’s a co-chair of KPMG’s Disabilities Network, and a supporter of Special Olympics. At the World Games in New Jersey in 2014, KPMG sponsored the Golf Tournament with hundreds of its employees volunteering to drive golf carts and help in other ways. It’s no surprise that “inclusion” is a favorite word of Kelly’s – it comes up when he speaks of family, of work, and his worldview. The very definition of inclusion may well be the key to his personal and professional success. After all, he’d be the first to tell you he didn’t do it alone. Shaun and his wife, Mary, surrounded by their children, left to right, Timothy, Lauren, Natalie and Rachel. Who were your early influences at KPMG? I have worked with great leaders in KPMG, including Eugene O’Kelly, Tim Flynn and John Veihmeyer, all of whom set some really great values for the firm. Gene was the first partner I worked for when I arrived in San Francisco in 1984. I learned a lot from him about the importance of building relationships and recognizing what your own person- al unique selling point is. He helped me understand that my Irish background was a way to help distinguish myself and build relationships. He was also a great believer in investing in people. In the late 1980s when Mary and I were thinking about returning to Ireland to raise our two daughters, I was flying to Belfast from San Francisco to speak to a few people about what opportunities there might be. I had told only a few close friends that I was thinking of going home. Gene got wind of it and as I was sitting at the gate in SFO my name was paged that there was an urgent call for me. I thought it was Mary looking for me but it was Gene. He said he understood that I was considering going back home and if that was my decision he would respect it but he urged me to at least speak to him before making a final decision. He said I really needed to fully understand all of my options in the U.S. before deciding. In the end Mary and I did decide to go back, but Gene taking time to reach out was the mark of a great leader. Just before he passed away in 2005, he sent me a personal note thanking me for all that I had done when I had worked for him and to wish me well in the future. He sent similar notes to many others. One of the things I learned from Tim Flynn was the importance of recognizing the leadership potential of your team and to have the courage to give them the opportunity to lead even when it seemed like a strange move or a stretch for them. In 2005 I was leading our Transaction Services (M&A) practice. When Tim became KPMG Chairman and CEO, succeeding Gene, he reached out to me to ask me to become the leader of our U.S. Tax practice. I had never worked in our tax practice and it was a much bigger business than the one I had been running. When I raised this with him, he outlined his rationale. He told me that I would be working with a strong tax leadership team that had great tax skills and that what I was bringing to the table was strong communication and relationship building skills and the ability to grow businesses. I was very nervous at the start, but in the end it worked and I look back with pride on what we achieved in the tax practice for the five years I had the privilege of leading it. What are some of your own personal leadership maxims? In our business of public accounting, I think trust and integrity and being honest and telling the truth at all times, are paramount. It sounds very simple, but to always say please and thank you is important. That’s something we Irish learned at an early age from our parents and grandparents, and another was to treat people with respect and dignity. Seeing a lot of things I saw in the 70s, you certainly understood that everybody is important no matter their background and you should treat them all equally and with respect and dignity. And in business, if in difficult times you sometimes have to let people go you have to remember they are important and they have a family and people who depend on them, so treat them with respect, and help them move on. The other thing that is important is to take responsibility, particularly in leadership. It is good to celebrate success and take the credit for success on behalf of the team, but also take responsibility when things don’t go right, by saying, “I was in charge, that was on my watch, that was my responsibility.” So hold yourself accountable and do the same for others. I’ve seen young leaders make the mistake of not holding others accountable. If someone is working for you and they aren‘t delivering, you have to call them out. Don’t try to brush it under the carpet or not take it head on because you don’t want to have a difficult conversation. Having those honest and difficult conversations in the right way, in the right manner, is the way to go. What comes first, strategy or team? I remember at UCD Business School the message was, “Set your strategy and then hire people who fit your strategy.” I’ve learned that yes, you need to have a strategy, but things change so much. Look at what I have seen in the past 15 years – the dot com bubble burst, 9/11, the financial crisis. These events happen more regularly now, but if you‘ve got the right people, smart people, they’ll figure out the right strategy. They will know when to change and how to change the course. In other words, hire the right people and the strategy will follow. Also, I am a big believer in building strong trusting relationships both in business, internal to your own organization, and personal. No matter what we say about technology advances, having the right relationships is really important. I still keep in touch with the people I went to UCD with. Now they are CEOs and in other important positions, and that network and those relationships are important to me. And on the personal side, I remember moving to San Francisco in 1984, having just married Mary. We knew very few people. We were learning the new environment but during that time we built strong relationships, friends that we have today over thirty years later. So, I would tell the young millennials to remember to build strong and trusting relationships; internal and external. What are some other qualities of a good leader? Don’t panic when things are getting tough. You have to have a sense of urgency, but don’t panic. Your team is relying on you to say, “Let’s take stock of the situation. What do we need to get done? Here are the ten things we need to address.” And you know, people do amazing things in tough situations. I saw it – especially after 9/11. The last thing the team needs [in a tough situation] is a leader running around with their hair on fire. 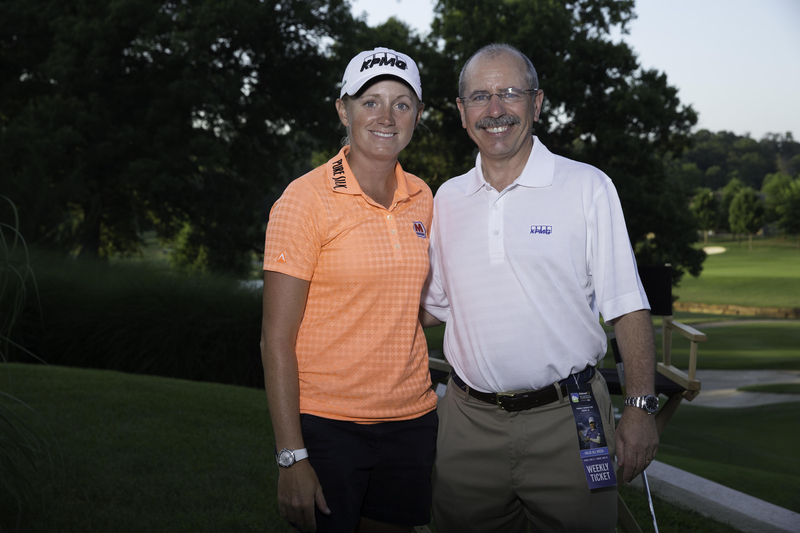 KPMG sponsors pro golfers Phil Mickelson and Stacy Lewis, who, pictured above with Shaun, support KPMG’s literacy efforts. KPMG donates 5,000 books to a local organization for every win on the golf course. You left KPMG and moved back to Belfast for a time. How did that work out? I moved back to Belfast in the 1990s, when I joined a small firm with other KPMG guys. We actually built it up into one of the largest firms in Northern Ireland. My sister works with Belfast City Council. And when I was there, I did a lot of work with the city on economic development. I worked in corporate recovery and one of the jobs we had was that we were the receivers to the Europa Hotel in Belfast. It was bombed twice when we were the receivers. The Europa was the most bombed hotel in the world. The government did provide some funds to help with the rebuilding, but as the hotel was in receivership, we did not know if we could access enough funding to keep it up and running. I remember that we had a meeting with the staff. There was this one guy from West Belfast. He said, “Mr. Kelly, I know you are all very smart men, but I’m telling you that this hotel was never closed and it’s not going to close now.” We did keep it open and were able to find a buyer, and the hotel is a very successful business today. I remember having some similar discussions with people after 9/11. You can’t let [a disaster] stop you getting on with your life. Instead you say, “You bomb it – we will build it again. You keep bombing, we‘ll build it back up again.” And that resilience is what got us through the Troubles and it’s still there today. The other thing I learned in the 1990s was that if people have an opportunity to make a living, to have education, to have homes, they tend not to be shooting at each other. So we worked closely with government and the private sector to attract investment. We worked on the Laganside Project to develop and regenerate the center of Belfast and build the Waterfront Hall and the Belfast Hilton. We worked on financing for that and helped get it established with the support of the International Fund for Ireland. And that is why the work of International Fund, and the American Ireland Fund (AIF) is so important. When did you join the AIF? I actually helped the AIF, which was really pleasing, to bring Enactus to Ireland to set it up. KPMG has been a big supporter of Enactus [the non-profit that works with students and business leaders to transform lives through entrepreneurship], for many years and I am the secretary treasurer. UCD won the Irish competition last year, which was great. And there is an Enactus team at Queen’s [university] in Belfast. Also, KPMG has been a strong participant in the U.S.– Northern Ireland Mentorship Program that Declan Kelly started with the American Ireland Fund. We are in the process of hiring our fifth mentee in the U.S. And one of our mentees just joined KPMG in Dublin. The other thing we have done with Queen’s, through the City Scholars Program, is take students at the end of their first year and give them three weeks experience with our firm. Part of the reason why I am very supportive of that is because I think Queen’s has a big role to play [in the future of Northern Ireland]. Back in the 70s, Queen’s was non-sectarian and encouraged enrollment from Catholics and Protestants. And I think what they are doing today, and what [University President] Paddy Johnson is doing with the cancer research and his vision for Queen’s is very important for Northern Ireland. We are great supporters of the university, and the caliber of the students who come over is just outstanding. You recently were in Belfast to receive an honorary degree from Queen’s. How was it to be honored on your home turf? It was amazing. I spoke at the graduation of three distinct groups: The School of Education, The School of Modern Languages, and St. Mary’s University College in the Falls Road, and a lot of those students actually graduated in Irish [language]. Many of their parents there were contemporaries of mine, and it was great seeing them all again. The experience also reinforced where Northern Ireland is at now. It still has a way to go but we are moving forward. We are starting to see the vision of what the new Northern Ireland is going to be like, and that vision is of a more open society. My younger nieces and nephews get a little bit tired when we start saying, “Oh, remember how it was like in the 70s? It was terrible!” But I think to move forward, you have to remember the past because you don’t want to make the same mistakes. Seamus Heaney is someone you admire – are you moved by his poetry or is it his life story and NI connection? It is his poetry but probably also because of his life story and NI connection. How he reflected NI life both rural and urban and the impact of the Troubles. Having a Nobel Prize winner from NI is a great inspiration to us all that we should have the confidence that we can achieve great things even being from such a small place. I had the honor of meeting him several times and what impressed me was how humble and open he was. We had great conversations on many topics including Gaelic football and the financial markets. I was also impressed that he was not only highly admired by critics and academics but also by the broader public. My wife is big fan of his too! John Hume (former Social Democratic Labor Party leader) is one of your heroes. Why? First of all, he was part of the first generation in Northern Ireland to have access to free public education, and coming from the Bogside and achieving all that he did, he was always focused on giving back to the community. He helped establish the first credit union in Northern Ireland. He also was such an influential figure in the peace process from the early days of civil rights marches to the Good Friday Agreement. Inspired by Martin Luther King, Jr. he was a strong proponent of nonviolent protest. His courage in initiating private talks with Gerry Adams was a pivotal marker on the road to peace. And again, he’s another Nobel Peace Prize winner. In addition to its other good works, KPMG is also shining a spotlight on women. Yes. This year KPMG developed a one-of-kind multifaceted program called the KPMG Women’s PGA Championship. As the first partnership between the LPGA Tour, PGA of America, and KPMG, we wanted to further demonstrate KPMG’s commitment to the development, advancement, and empowerment of women. The Championship is not only a world-class women’s golf tournament, but a women’s leadership summit held on site during the week of the tournament and an ongoing community initiative focused on developing the next generation of female leaders. The Summit provides content, tools and networking to encourage women’s advancement to an advisory council comprised of exemplary leaders from across business, sports, and the media help guide it. Our goal is to help more women move into the C-suite. Many things! I was introduced to it by my father- in-law who was a longtime member of North West Golf Club outside Buncrana in Donegal. I find it such a great stress reliever – most of the time! I like the challenge, it is not a game of perfect shots, it’s a great test of your character and patience. It is also a great way to build relationships and friendships. I have a group of friends and we have been going to play in the British Isles for a week every year for almost 20 years. I particularly love playing the great links courses of Ireland. My favorite is Ballyliffin in Donegal where I am a member, but there are many other great courses particularly in the North, Royal Portrush Royal County Down, Portstewart, and many more. It has also given me the opportunity to spend time with my son Timothy. He likes to play and it’s a great way to spend 4-5 hours together. It is getting harder now as he is away at college. Like most fathers and sons who play golf together, we do not say a lot on the course but it is great quality time. A last word about Belfast. There’s a lot of pride. Belfast played a key role in the post-industrial revolution. John Dunlop developed his pneumatic tire there. The first air-conditioned public building in the world was the Royal Victoria Hospital. The Titanic was the largest man-made object ever to take to the seas – and in addition to shipbuilding you had the linen industry. Belfast was like the Silicon Valley of its day. Its [success] was based on entrepreneurship, and I see that coming back. When I attended the American Ireland Fund conference last year in Belfast, I met some of these young entrepreneurs. You’ve got young guys and gals in Belfast going, “I am a founder and CEO of such and such. I want to build my headquarters here.” And that sounds so “can do.” You have great U.S. companies such as Citi, Allstate, Liberty Mutual and NYSE Technologies. It is really exciting seeing that. I think sometimes we undersell entrepreneurship in Ireland. It is a bit like we undersell ourselves. That entrepreneurial spirit – and it goes way back into the industrial revolution – is still very much alive. For eighteen years, Irish America has sought out and recognized the best and the brightest Irish-American and Irish-born leaders in the financial sphere, and this year is no exception. The fifty honorees of 2015 are an extraordinary, inspiring, and diverse group – from standout rising stars to masterful Wall Street veterans, this year’s list is comprised of both new faces and longtime friends of Irish America. And as varied as the counties they come from, so too are the sectors in which these distinguished financiers work. The 2015 Wall Street 50 honorees share a commitment to bettering the American economy. Some do this by handling investments and capital, some by developing and implementing the strategies and technology that make it all happen. Together, they recognize a heritage of unrelenting perseverance, a commitment to family, and the responsibility to others because of the struggles of their ancestors. That shared heritage is also, as Aidan Kehoe puts it, “an instant ice breaker with everyone you meet.” We couldn’t agree more. The honorees featured in the pages ahead are a testament to the power of the diaspora and its ground-breaking influence – from the fourth-generation Irish Americans who are themselves the manifestation of their ancestors’ dreams, to the many Irish-born who continue to work to maintain the strong connections and forge new bonds between our two great countries. Click through the list here to see the honorees. There is something about anniversaries that appeals to people. And it’s our 30th. If it were a wedding anniversary, pearls would be an appropriate gift. There is something about the pearl that speaks to the story of the Irish in America. Born out of grit, a grain of sand, an outsider makes its way into a shell and sets off a chain reaction that in time results in a precious gem. What could be a more appropriate symbol of those plucky early Irish immigrants – outsiders all – pushing past obstacles to gain a foothold and proceeding forward with grit and determination until they solidified as one of the true cultural cornerstones of American society? As I review our 30 years of publishing Irish America, all the stories merge into a cultural capsule. For the early immigrants the going is tough, but mingled into their hardscrabble existence are also great moments of joy. And, in all their trials there seems a strength of purpose, a refusal to quit and an indestructible pride in heritage that carries them forward. Looking back over the issues, I pause over every Civil War story – more often of late as the 150th anniversary is commemorated – and reflect on how this central event in American life was also a turning point for those early immigrants. Their brave fighting won them respect and more acceptance, but the cost was so very high in terms of lives lost. My hand hovers over the front cover of the Famine issue with its image of “Anguish,” a sculpture by Glenna Good-acre. It was a painful edition to produce; the rawness of that seminal event is a scar on my DNA that still hurts, but here too are stories of survival, and overcoming against the odds, and of people who helped us in the worst of times. And I fight back tears over the 9/11 coverage, reminded as I am at this time every year of the many we lost from the community. The traditional strongholds of the Irish in New York – the public service sector – firemen and police were decimated. And so many from the financial services industry – colleagues of those we honor in this issue. Our very first Wall Street 50 event was held at Windows on the World, a venue on top of the World Trade Center’s north tower. But again, with this story, we are reminded of the forebearance of the survivors and the unifying force of the tragedy that forever melded Irish and Irish American. As I continue on my journey back through time, I’m often bemused by interviews with people who contribute to the sheer joy of life, reminding me that though those early immigrants had little in the way of material possessions when they embarked on their outward voyage into the unknown, they carried their music with them, and a love of dance, and a good story. And these gems of heritage have been passed down to future generations. Perhaps one of our most precious assets became the ability to meld our tradition with change and other cultures. Gene Kelly, the great song and dance man, in one interview talked about how Irish dance influenced American tap. In other stories we learn of Irish influences in country, folk, and other musical genres. And we see many cases of how our love of a good story gets carried onto stage and the silver screen by writers and actors and directors. The son of a famine immigrant, Eugene O’Neill would be the first American to win the Nobel Prize in Literature, in 1936, his work heavily influenced by his Irish heritage. I’m also reminded of how lucky I am to be part of Irish America as I peruse these back issues. My position as editor afforded me access to some of the greatest minds of our generation. I sat down with Seamus Heaney shortly after he received the Nobel Prize, and such legends as Gregory Peck and Maureen O’Hara, and I interviewed business leaders such as Jack Welch, and, for this issue, Shaun Kelly. And political leaders including George Mitchell and Gerry Adams, both of whom would play such a vital role in the peace process. I remember how thrilling it was to hear Adams, back in 1991, say it was time for talks and a political solution in Northern Ireland. I was privileged to see firsthand the role that Irish Americans would play in the years that followed – Bill Flynn, Tom Moran, Donald Keough, Chuck Feeney, and Ed Kenney, to name but a few, who in Heaney’s words made “hope and history rhyme,” and helped put a peace plan in place. The North and immigration are two reoccurring themes over the years in all our issues. In the early days of the magazine, it was about the Morrison visas that threw a much-needed lifeline to the Irish as the economy struggled in the 80s. We saw the Celtic Tiger come and go, and sadly, more recently, we are witnesses to another generation of young Irish who are forced to leave in search of work. But even as a recent survey confirms that one in six Irish people born in Ireland now live abroad, we can take comfort in our global ability to integrate with other cultures, and find success in all corners of the globe. As our cover story attests, Shaun Kelly is a prime example of the successful Irish immigrant. His story also touches on Northern Ireland. Born in Belfast to an English mother and an Irish father, he grew up during the Troubles, and that experience had infused in him a desire for diversity in the workplace and purpose-driven life. As KPMG’s COO, Americas, he is involved in various projects and communities around the globe. On September 3rd this year, the photograph of Aylan Kurdi, the Syrian three-year-old whose body washed ashore on a Turkish beach, ran across the front pages of newspapers world-wide, putting a horrifying human image to the crisis that has embattled Syria for almost five years. Many periodicals, such as the Irish Times, debated whether or not to censor the image, but ultimately went forward with the undoctored photograph. Many have likened the harrowing picture to the 1972 “Napalm Girl” photograph, which put a face on the atrocities committed in Vietnam, rousing many in the western world to action. Over an estimated 4 million Syrians have left seeking refuge since the crisis began (which, according to Concern Worldwide US, is over one fifth of the total number of displaced people in the world), and while the majority have flooded into Lebanon, Turkey, Jordan, and Iraq, roughly 200,000 are making their way to Europe. As émigrés stream out of Syria, the EU has called upon its members to accept more refugees. Frances Fitzgerald, Ireland’s Justice Minister, recently confirmed that Ireland would accept 4,000 refugees. In her statement regarding this decision, Fitzgerald said, “Ireland will offer a welcome safe haven for families and children who have been forced to leave their homes due to war and conflict.” The head of the Irish Refugee Council has estimated that the country could house up to 40,000 Syrian refugees, and the government is currently examining vacant government buildings to determine if there is housing available for more than the agreed-upon 4,000. “We have to decide at certain times in our life to do what is right and what is right is to come to the assistance of those who, like our own ancestors, were being lost in the sea of the Atlantic three generations ago,” said Irish president Michael D. Higgins, drawing on the parallels between Ireland’s Famine emigrants and the modern crisis in the Middle East. In addition to the government’s response, Irish individuals and organizations are taking action. Rocker and humanitarian Bob Geldof has publicly stated that he and his wife, Jeanne, would be willing to open their homes in Kent and London to families of refugees. (The Dún Laoghaire native has a history of philanthropic activity; most notably, he was one of the main organizers of the Live Aid concert series in 1985, which raised over $125 million for famine relief in Africa.) Even Pope Francis has suggested a similar, community-level solution, wherein each Irish parish takes in a refugee family. As we go to press, the Northern Irish peace process faces one of its greatest challenges. First Minister Peter Robinson, the Democratic Unionist Party leader resigned his position in September, along with several other DUP ministers, following the Police Service of Northern Ireland’s (PSNI) claim that individual members of the Provisional IRA (PIRA) were involved in the killing of former republican prisoner Kevin McGuigan last August. According to news reports, some PIRA members believed McGuigan was responsible for the killing of former IRA commander Gerard “Jock” Davison in May. George Hamilton, head of PSNI said that PIRA leadership did not sanction the murder of McGuigan, but his assertion that some structures of the organization still exist, led the more radical Ulster Unionist Party’s sole executive to resign his post, and the other twelve MLAs to withdraw urging the DUP to do so as well, citing an inability to trust Sinn Féin who deny the continued activity of PIRA members. Robinson and the DUP initially resisted, and sought an intervention from Downing Street, but were refused, with British Prime Minister David Cameron reportedly asking the Assembly to find an acceptable solution on its own. But tensions reached a high point when the PSNI brought prominent Sinn Féin member Bobby Storey in for questioning in connection with the murder. Though he was released unconditionally a day later, Robinson under intense pressure from the UUP, resigned. Robinson retains his role as head of the DUP, but has appointed Minister of Finance Arlene Foster as acting First Minister, ostensibly allowing the Northern Irish Assembly to continue governance, but effectively causing a stalemate for the DUP – Sinn Féin power-sharing government. “Isn’t it ridiculous that criminals, low-life murderers who killed two men have the ability to bring down these democratic institutions?” McGuinness asked. For more updates, visit IrishCentral.com. Two recent reports from the Organization for Economic Co-operation and Development and the Central Statistics Office show that more than one in six Irish-born no longer live in Ireland. In the latest biennial assessment of the Irish economy published by the OECD, it is reported that in 2014, 17.5% of all people over age 15 that were born in Ireland were living abroad, while the CSO reports a 34% drop in 20 to 24-year-olds over the last seven years, along with a 27.5% drop in 25 to 29-year-olds. In a recent press release, Sinn Féin Jobs, Enterprise and Innovation spokesperson Peadar Tóibín commented on the figures: “A third of a million Irish people in the last six years voted with their feet, leaving an economy that put unsecured debt and upper income security above provision for citizens. Ireland’s percentage of native-born living abroad was the highest amongst the OECD’s other members, surpassing New Zealand, Portugal, and Mexico by several percentage points. Though the CSO says emigration has begun to slow, net migration is still negative, meaning still more people are leaving Ireland than are moving there. Speaking on behalf of the university, Professor Peter Hamilton of the Digital Pathology program, said that the awards demonstrate “how Belfast has been leading in digital biotechnology research and diagnostics,” and serve as a testament to the university’s growing influence among U.K. institutions. Cathal Redmond, a 26-year-old University of Limerick student, has won the 2015 Irish James Dyson award for his underwater breathing invention. His device, called the “Express Dive,” allows divers to breathe underwater for up to two minutes. When their air runs out, they simply resurface and refill the apparatus. As opposed to traditional snorkels, Express Dive gives divers access to greater depths, but unlike traditional scuba diving equipment, which allow for similar feats, Redmond’s device costs roughly $500, as opposed to figures as high as $4,000. The prototype for which Redmond won is built of a compact air tank, an air regulator, and a compressor combination made of high-density foam, aluminum, and silicone. An avid swimmer with an interest in adventure sports and music, Redmond received €2,500 from the James Dyson Foundation, named for the creator of Dyson vacuums, and will proceed to the international stage of the competition along with 600 students from 20 countries. The grand prize is €37,500.